If you have listened for a while to our podcast, you know that we talk a lot about small steps towards a more sustainable life we all can implement. All these individual actions together have the potential to make a big differen ce. Mark Lefko has a different approach. 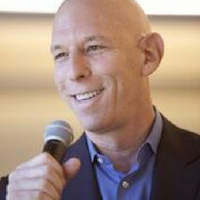 His goal is to influence big companies to do better. That doesn’t mean to make more money – at least not exclusively. 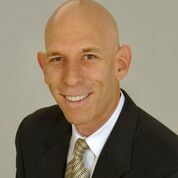 Mark is deeply committed to teaching CEOs about the benefit of the Triple Bottom Line. Each action must be good for the people, good for the planet and bring profit. Let’s wish Mark lots of success in his mission. 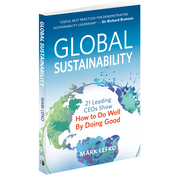 In his book, Global Sustainability, Mark interviews 21 CEOs of large companies. See the list below. In our interview, Mark was encouraging all of us to buy local whenever possible. So, if you have a local bookstore, please ask them to order it for you. It is a very interesting read and gives us a lot to think about – including how consumer behavior influences the actions of the corporations. The next best thing is to buy the hardcover version and donate it to your local library after you finished reading it. If you are interested in a completely different approach to the economy, you might enjoy the following episodes.